1/12/09 – Acquisition – York, Art Gallery – The York Art Gallery which already holds the world’s largest collection of paintings by William Etty , a native of the city, has just acquired another work by him, Preparing for a Fancy Dress Ball (ill.). Etty is one of the finest English painters of the first half of the 19th century. His nudes, almost Rubens-like, often presented under a mythological pretext, represent his best known works. Their sensuality elicited criticism from a somewhat prudish press. He also painted religious or historical scenes, such as The Repentant Prodigal’s Return to his Father (Ashmolean Museum) or the large Joan of Arc riding out of Orléans and charging the ennemies of France from the Musée des Beaux-Arts in Orléans, as well as portraits, the earliest of which reveal a strong influence by his master Thomas Lawrence . The work acquired by York was commissioned in 1833 by MP Charles Watkin Williams-Wynn. 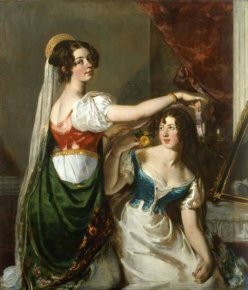 It represents two of his five daughters getting ready for a reception ; Charlotte, the older of the two, is helping her sister Mary to fix her hair with a ribbon and a rose. The very beautiful treatment of the fabrics confirms William Etty’s qualities as a colourist. The painting has been on display in the museum gallery since 26 November ; it will be included in the retrospective highlighting the artist which is to take place in York in 2011.